Venerable Gyatrul Rinpoche was born in 1924 in China near the Tibetan border. At the age of 7 he was recognized to be a tulku, or consciously reincarnated teacher, by the great meditation masters Chokyi Lodro and Tulku Natsog Rangdrol. Rinpoche was trained at Payul Dhomang Monastery in eastern Tibet by such adepts as Sangye Gon, Tulku Natsok Rangdrol, Payul Chogtrul Rinpoche, and Apkong Khenpo. Rinpoche spent many years in solitary retreat with his root guru Tulku Natsog, moving from one isolated location to another. In 1959, with the Communist invasion of Tibet, Rinpoche fled to India, where he lived for 12 years. Then, H.H. the Dalai Lama and H.H. Dudjom Rinpoche requested Gyatrul Rinpoche to move to the West to teach the Dharma. In 1976, Rinpoche was appointed as H.H. 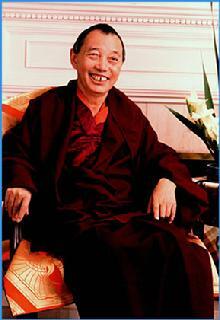 Dudjom Rinpoche&apos;s spiritual representative in America.